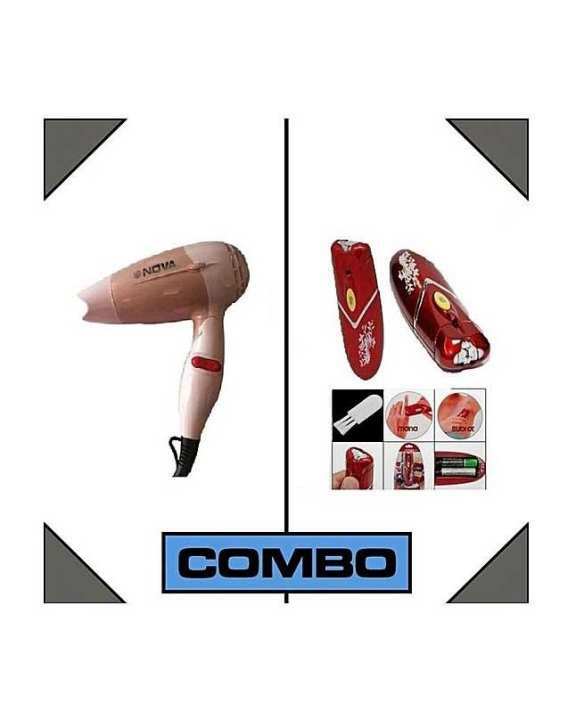 Combo Nova Hair Dryer + Micro Tweezer Hair Removel Micro Tweezer Hair Removel A complete hair clearing which successfully ousts the undesirable hair from legs, underarms and two-piece line is removed speedier, leaving the skin smooth and smooth. The unit is totally electric and goes with a connector. A noteworthy hair clearing structure that uses a dynamic tweezer circle system with twofold limited heads. Electrically worked with 36 tweezers on a twofold element surface to develop the skin and think seriously about more hair to be ousted from the root more adequately and all the more rapidly. Perfect for touchy regions. Nova Hair Dryer Nova Foldable Dryer Whether you are attending a wedding reception or a business event, you can make your hair look smooth and lustrous with the help of this hair dryer from Nova. Speed Settings With two speed settings, it gives better control over drying and styling your hair, so you can choose the settings that best suits your hair type. The cool shot professional finger diffuser and styling nozzle let you try out different hair styles every day. Foldable Handle The handle is easy to hold and provides a firm grip every time you blow-dry your hair. It consumes 1000 W of power for quick drying and styling your hair.